Today marks the fiftieth anniversary of the beginning of the Freedom Rides, a series of acts that openly defied segregation in the South. Irene Morgan was arrested but her case, Morgan v. Virginia, went all the way to the Supreme Court—which ruled that segregated seating in interstate travel was unconstitutional. In 1947, CORE staged the Journey of Reconciliation, what is often called the original Freedom Ride, to test the Supreme Court’s decision outside the courtroom and in the real world. CORE members “knew that Southerners had ignored the Morgan ruling, and they wanted to force the issue. If they were arrested, then attorneys and media could bring attention to the injustice.” Fourteen years later, that desire to attract the media would prove vital to turning the tides in Americans’ eyes regarding segregation and civil rights. And so they did. On May 4, 1961, thirteen Freedom Riders left Washington, D.C., headed for Alabama–the Deep South. When the buses stopped in Alabama, they were attacked by angry white mobs that included several members of the Ku Klux Klan. Several of the Riders were hospitalized and many were beaten to near death, but their suffering caught the attention of the nation at large. “The Freedom Riders had paid a heavy price, but they finally received the national attention they had been seeking. 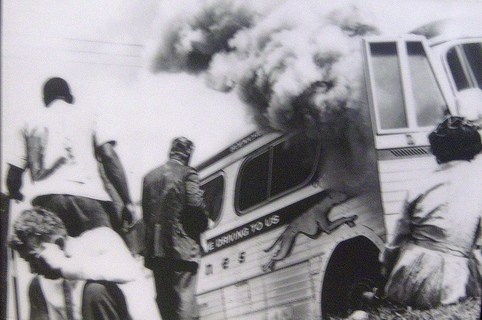 . . images of the burning bus and bloodied riders appeared in newspapers and on television. . . . .To African Americans, the publicity that the Freedom Rides were creating was doing a world of good. This was revolutionary. After three hundred years of oppression, black Americans were shaping their destiny,” writes Aretha. The more Freedom Rides took place, however, the less news coverage there was. Eventually, the media moved on.